Source: William Mercer and John Goss, eds., The Church Psalter and Hymn Book. Oxford Edition. (London: James Nisbet and Co., 1864), Hymn #98, p. 51. Brightness of the Father's face ! Equal with the Father, One ! Ere the worlds their course began ! From the heart's low altar rise. Thou the Life, the Lord of all ! To its vileness sink again. Bless him for his gift divine ! Pour your songs into his ear. Praise to his Incarnate King ! For his love, so vast and free ! For the triumphs he hath won ! For the grace whereby we live ! Praise Him, all below the sky ! Father, Son, and Holy Ghost ! 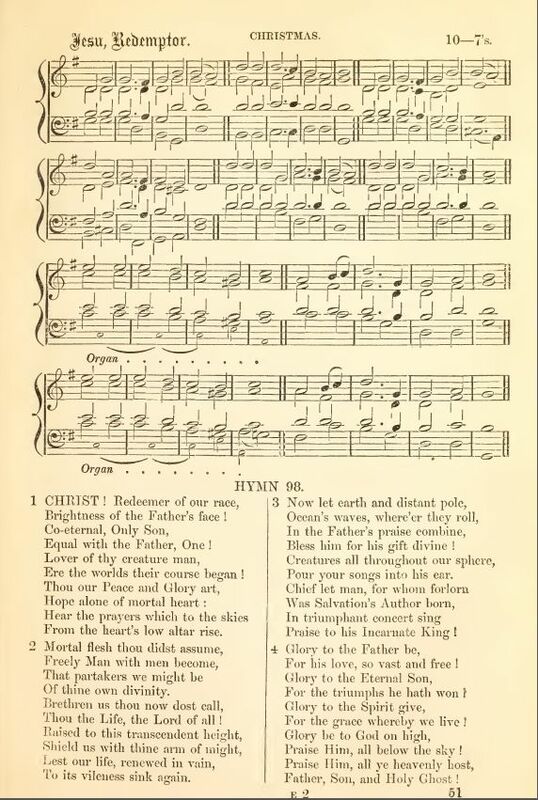 Sheet Music from William Mercer and John Goss, eds., The Church Psalter and Hymn Book. Oxford Edition. (London: James Nisbet and Co., 1864), Hymn #98, p. 51.